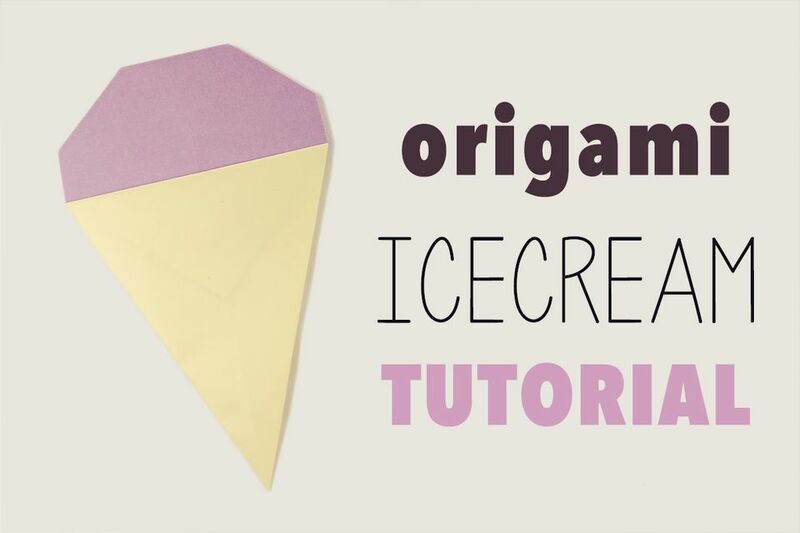 To make this cute origami ice cream you will need 2 pieces of square paper. 15 x 15 cm paper is used here, but using 5 or 10 cm paper works just as well. This origami model would be considered modular as it uses more than one sheet of paper. To complete, you can glue them together (as is done here) or you could do a bit more folding and manually attach them. Make and decorate them in whatever colors or accents strike your fancy. To start, have your paper white side up if you have a white side to your paper. 1 & 2. Fold the paper diagonally in half and unfold. 3 & 4. Fold the left and right edges into the center as shown. 5. Fold the top point down. 6. Unfold all of the folds. 7 & 8. Refold the folds, with the top point under the side flaps. 9. Flip the model over - the ice cream cone is done! Make sure your paper is white side up. 10. We'll be making a center mark. 11. Fold the paper in half marking the center lightly. 12. Fold the paper in half the other way and again mark the center lightly. 13. Fold all four corners to the center point. 15. Put the Ice-cream into the cone and turn it over. 16. Align it nicely and fold the ice cream edges to meet the cone. 17. Fold the top of the ice cream inwards. You may want to use some glue to stick them together at the back. If you've made one, please tag #paperkawaii on Instagram so that I can see it!